My daughter loves the look of bangs. I have a love/hate relationship with my own bangs. I cut them short, then I let them grow out and do it over and over and...well, you get the point. I always thought to myself, I would love to have them short one day and long the next. Well, I'm here to tell you that it is possible! After giving Miss A's little cousin twisted bangs several people asked me how they could achieve a similar look on long hair so I decided to try the same exact style but tweaked it a little. Read below for the simple instructions. 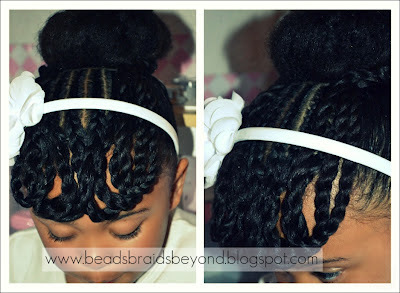 On stretched hair, I parted a square on the top middle section of her head. Using a metal rat tail comb, I parted a medium section within the square. I cornrowed that section straight down toward her forehead until I reached the end of the cornrow, I then began doing a basic two strand twist. I repeated this process 6 times. After I was finished with the top I did a simple bun. Since Miss A's hair is long enough, we no longer need the sock bun method. I simply placed her hair in a ponytail, gathered the hair, twisted it and wrapped it around the ponytail holder. I posted a picture tutorial on how I do this with her twists here, if you need more of a visual. After creating the bun I moved on to the fun part- bangs! I grabbed three twists in the front and turned them up toward the right side. 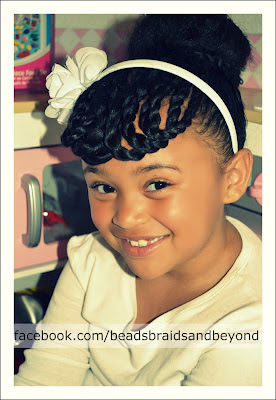 I pinned them in place near the side of her bun and wrapped the remaining hair behind the bun. I did the same thing on the left side. To make the twists come together and look like real bangs, I pinned them together with a few bobby pins. I placed the bobby pin right at the end of the cornrows, through the twists. I added a headband and viola! You've got bangs! The headband added a bit of a retro look, if retro is what you're going for, try tying a scarf over the cornrows. She was thrilled to have bangs and said it was a big hit at school! So beautiful! Where do you get all of her flower headbands?